[Epstein] is applying to have a Political Sign displayed on her property. The nature of the impasse is her belief that it is a general sign and not a political one. As the cluster board we reviewed this issue at our most recent board meeting in June. We voted to request its removal under the general RA Signs rules. The resident in question also confirmed that this sign was given to her by the Democratic Party at one of the Reston Farmer’s Market this year. The DRB panel denied Epstein’s request to overrule the cluster association and allow placement of the sign, she said, on the basis of its size. 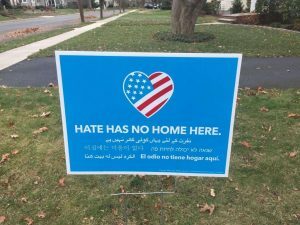 Reston Association’s rules for small yard signs say they must be no bigger than one square foot in size to be displayed without a permit. The size of Epstein’s sign is the standard size distributed by the Hate Has No Home Here project. Temporary political signs, up to 2-by-3 feet, are allowed by RA to be displayed in support of candidates or ballot issues, but must be removed “no later than one week after announcement of election results.” Epstein contends her sign is “clearly not a political sign,” but rather “promotes just and inclusive communities.” She says she intends to appeal the decision to the full Design Review Board for review and consideration, and she will be obtaining a one-square-foot version of the sign to display in the meantime. 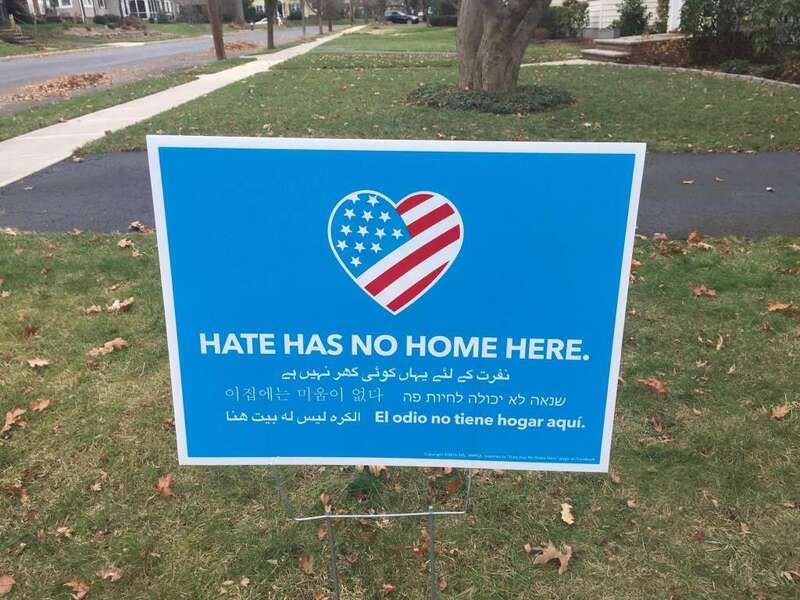 In Reston, the “Hate Has No Home Here” signs have been distributed at numerous locations including the Lake Anne Farmers Market, as well as at local businesses throughout our community and are available for any individual or group to download the artwork for free. In light of the recent tragic hate crime that occurred nearby, it is more important than ever that our community demonstrates our support for one another and ensures that everyone feels safe. According to “Another Way of Living: The Story of Reston, VA,” a video project, our founder Robert Simon dreamed of “another way of living” that valued community, nature, diversity and social equity. This innovative American planner set out to build a new kind of walkable suburban community that integrated citizens across racial, economic and religious divides. I have to believe that Robert Simon would embrace the “Hate Has No Home Here” project. “Today I feel disappointed to be a resident of Reston,” she said in an email.